Christmas Eve Reflections - Who's in and Who's out? A family of humble origins. Not from around around here. Some sort of non-traditional family. It's hard for me to read the Christmas passages without imagining a come-from-behind story. This isn't a winner sweep. There's no Triple Crown here. We're talking about an unlikely winner, a child and out-of-towners. They didn't belong. They didn't fit in. One focus of this Christmas is to examine in my heart if I am welcoming this family into my life. Do I reject them and their family? Do I separate them, like we do immigrants in this country? Have I made mistakes in the past? Sure. Just a few days ago, I forgot who I wanted to be and remembered once more how much effort it takes to live out the life Christ demanded. My mind was distracted by a Christmas shopping rush slamming against a busy work day. I had only a sliver of time to grab a meal before going on to my next meeting. I ran into a local eatery and grabbed a meal which I was wolfing it down. A gentleman of seemingly modest means asked if I would mind buying him lunch. In my rush, I shook my head and grumbled that I was late and I had to get going. I might have even growled and rolled my eyes. He disappeared, before I realized what I had done. I searched the restaurant, the parking lot, the nearby bus stop. He was gone. I chased him away with my cold, uncaring heart. We were two blocks from Union Station Homeless Services, a place I lavish time and donations to support, and yet here, in my self-focus, my self-importance, my me-first attitude, here I sat, food in hand, heart like a stone in my stomach. I spend countless hours helping and trying to help, and yet with a couple painful words trample on the life I was trying to nurture. I turned away a simple, honest request for mercy. I sent him away to his manger. I ran to my car and wept. If I could redo those precious moments once more, the story line would have been different. That man would have gotten a warm meal. I wouldn't have dismissed his presence with my rush. My anxiety and attention to my life would not blind me to the hunger in another. If only I could relive that moment. Lord, grant me the breath and space to see cracks of light in the darkness of my blinders, that I might see the ones in need, that I might see the potential of greatness, that I might be the welcoming embodiment of warmth, spirit, and life. We lit the fourth candle on the Advent wreath at All Saints Pasadena this weekend. It's the candle of love, and it had me pondering about "love" and what it means to me. In tv, movies, and romance novels, it seems that love is about passion - raw, wild, intense. We at church seem to shake our heads when love is brought up in these terms. We tut-tut it because it's just so inappropriate and ought to be private and in the dark, under covers, and certainly not before you've finished school. On the other hand, in church, we often talk about the love of God as a paternal or maternal uberforce, with a strength that moves mountains, that conquers evil, making valleys level. This is a love that can beat the tar out of death and and yet was first made tangible in the form of a helpless infant. While watching the sunrise on the trails this morning, I'm resistant walking a path of a love mapped out in either of these directions. It just sounds so simplistic, superficial. It's doesn't feel adequate in either scenario, and it certainly doesn't feel sustainable. I know what feels like love to me. Love feels like sitting on the sofa with my Mom Saturday, both of us too full of eating bad food but knowing we're celebrating the season together. Love feels like listening to the nieces play guitar and sing together as I watch as a spectator in the audience, and as a participant by listening to them share their joy. Love feels like when I watch Dad transform into a kid again while he watches his grandchildren open gifts. It's also hanging with the inlaws, just catching up despite the distances traveled by some, without a schedule, without needing to be rushed. Love this past month at home meant sitting with my fiance, filling out Christmas cards, cleaning up the house, perhaps while he bakes and I cook, sitting together listening to music, watching football games. This love isn't intense. It's stable. Solid. Boring even. Love made plain because it needs no ornamentation. And yet... the path of love isn't only about walking a straight road. For love is not about isolation or nesting. We as always help out at Union Station Homeless Services on Thanksgiving Day for the Dinner in the Park event. We helped organize the setup this year. On Christmas Day, our larger family is joining in. After the Christmas Eve services where I'm singing and serving as a lay minister, after the family breakfast and gift giving, the family will join us as we finish Christmas Day in the park and do tear down and cleanup. Love in this case is about sharing our time with the friend dressed as a stranger. When younger, I used to fall for the cultural stereotype that the homeless are lazy bums just looking for a handout. But, as Pope Francis has described, who am I to judge? There are people on the streets who shouldn't be treated as second class human beings. And for the Christians out there, to paraphrase Episcopal Bishop Barbara Harris, there's no such thing as a second rate baptism. Many of the homeless are children, the innocent, the babes barely out of the manger. Recently, a powerful article called Homeless for the Holidays: Ending a Nation's Cruel Indifference to Homeless Youth moved me to tears. I know that in my community, one out of five homeless are youth. Love on a daily basis for me might be simple and about sharing time, but when I come face to face with those who are cold, weary, and hungry, love means doing something. Love for all of God's creatures means taking action. I feel compelled to do something because I do love Creation. Leaning back against a well and watching fellow brothers and sisters struggle doesn't ring true. Love means moving away from the wall and getting down on the dance floor. I've never twerked in my life, and I imagine I'll sooner bust a hip before I ever bust such a move. But that delirious almost Pentacostal wildness is what's needed when we try to help others. I might be content, sated even, with gentleness and candlelight at home, but we need strobe lights and a bouncing spirit to bring real help to those who need shelter and food. It's passion that's just as sweaty, intense, and gritty as any romance novel. Sometimes we groove to a slow dance. Sometimes we're moved to hip-grinding wildness. But, no matter how we're moved, let sway to the unrelenting rhythms of God's music. As I walked down the trails to my home wondering what an Advent of love means to me, I did a little skip, a little hop, a tiny dance. Once home, I gently woke up my fiance home on his Christmas vacation. In my soul, I was getting ready to twerk for all of God's family. Two states in two days. I like the folks in New Mexico. Truly, I'm happy that they got marriage equality yesterday. But today's news that UTAH's marriage ban was ruled unconstitutional, well that's different. Despite a history of compassion and integration among neighbors, the Church of Jesus Christ of Latter Day Saints (the Mormons) spent considerable time, effort, and money in California to usher in Proposition 8. Prop 8 has for many of us living in California been nothing short of a disaster. It represented the ability of a plutocratic, demagogic majority to withdraw equality from a set of citizens. Prop 8 wasn't the same as the Japanese internment, but I got a keener understanding of what mass discrimination meant on a personal level. Prop 8 wasn't foisted upon us Californians, as we voted it into place ourselves, but the LDS influence was considerable and notable. And I could not marry the person I loved in California because of Prop 8. So I couldn't help but jump for joy, yelping when I saw the news. 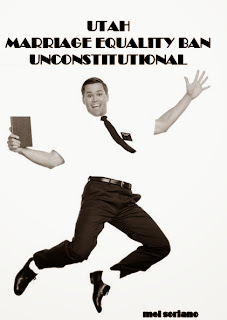 Today Utah, home of the LDS, had its own constitutional marriage ban ruled unconstitutional, just as California's was ruled unconstitutional by the Supreme Court in June 2013. This isn't a matter of spite to me. It's not a matter of gloating for those who believe that they can define marriage for others who don't love the people they're expected to love. Instead, I'm thrilled, thrilled because all the wonderful and caring gay people of Utah now have a way to be honest about their relationships, to let it be known that their love for each other is deep, God-given, and blessed by the Holy Spirit. If they lack a church, they can at least have that relationship acknowledged by the state as much as it is by the federal government. I'm thrilled because people don't have to "turn it off" and pretend that their love doesn't matter as much as the person's next door. I'm thrilled because the arc of history is long, and it really is bending towards justice. I've cared deeply about some the wonderful people of Utah ever since I started doing business there two decades ago. And it hurt to see so many people having to push their families into the closet. And worse, it was painful to see so many people from Utah come into California and affect our own families. I pray that the people of Utah will find it in their hearts to be open to the message of understanding and hope that today's news brings. It is the season of Advent after all, and for me, the love and joy that surpasses all understanding may be wandering into the mountainous west. Will we fit in? Maybe, just maybe, yes. A little prayer for our Labyrinth Ministry gathering last night at All Saints Episcopal Church in Pasadena. to the rhythms of the Holy Spirit. and the promise of our Peace. Advent 3 - The Candle of Joy. So be Joyful. Now! The third candle of Advent was lit at church this weekend. It's the candle of joy. I'm all for joy. After all, we look forward to Christmas because we expect to be full of cheer, mirth, and happiness. We're exhorted to be joyful in the Bible, such as in Romans 12:12 - "Be joyful in hope, patient in affliction, faithful in prayer." But it's awfully hard to be joyful all the time, much less an entire liturgical season. Thankfully, the candle is only for the last half of the Advent wreath. Nonetheless, at this time of year, the streets are filled with cars heading to malls, people stand in shopping queues that will last seemingly for hours, and the gift item you were looking for can't be found anywhere. I do almost all my gift shopping online precisely to avoid these problems. And for this, I'm supposed to have some creepy smile of joy that doesn't often feel sincere? Joy isn't even what we think it is. Joy is internal. All the back-slapping, laughing, carousing, and joking we think of joy is on the outside. It's the outward manifestation of something going on inside. Like all things on the surface, that external happiness can be spackled on with a trowel and made to brighten our facade. It can easily mask cracks and pains that we want to hide. I admit, I'm usually the optimist. I'm not content to say the glass is always half full; I would rather drink what's in that glass and ask for another. But you can't make someone joyful or optimistic. Joy comes from within. And sometimes, you hit a granite slab and that well runs dry. Even the very act of smiling can be painful. I was with the same person for eighteen years. For a long time, we were happy and gay. Not carefree, because the young have a lot of worries regarding money, but somehow it didn't seem so bad. When the relationship began to fray, I became confused and depressed. Oh yes, I put on a smile as was expected. But I wasn't happy, and I certainly wasn't content. When it all came crashing down and the relationship ended, there was no faking it. I couldn't smile. I had no joy to tap into to bring those smiles out. I took a sabbatical from choir because literally every hymn made me cry. I didn't cry out of sadness for me or for others. I cried because I had no joy welling inside of me, and music is, at its heart, powered by that joy. When asked, I would explain that I felt as though the Holy Spirit forgot who I was and left me a vacant sack of memories. That season of Christmas and Easter was awful. I had no strength to fake a grin. Sure I'd laugh with others, but it made a hollow sound, a tinny chuckle heard as though laughing into an empty can. It took time - a slow, painful journey of personal reconciliation and reflection - to find that the love of God was inside me still. It was obscured by my pain, by my guilt, by my self-flagellation. I needed to wait out this game of hide and seek and let that love once again walk into the light. There's no magic way to bring joy back into your dark spaces. I wasn't a Grinch with a heart ten sizes too small, waiting for the Whoos to sing around a wrecked tree. And when I see people today with sad, empty eyes, I don't try to cheer them up or force them to feel happy. I just hug them. Or e-hug them. Or smile with them. And most of all, I listen to them. And together, maybe, just maybe, we'll eventually hear a little sound of joy. Maybe, just maybe, we can light that third candle and let a little light shine out through the darkness of winter. Advent offers us a season of both hopeful waiting and penitential renewal. We shop, share, celebrate, and we also take stock of where we've been this past year and what we resolve to do during the next year. Scholar, author, and theologian Marcus Borg has recently blogged about the unfortunate emphasis on that penitence, that we should instead be focusing on the coming joy over the enduring sin. It caused me to nod in some agreement, but I couldn't get totally comfortable with his suggestion. Part of the Advent season to me is about retrospection, with a review of the past year, with prayers of a better year. It's hard to hope for future joy, justice, and peace without grasping all that isn't joyful, just, and peaceful today. Then, a recent sermon by All Saints Pasadena priest Reverend +Janine Schenone was posted on her blog. It gave me something to hang my hat on, a way to see Advent in a way that's more comfortable with both the current way of looking at it and Borg's proposed viewpoint. For penitence to me -- Advent, Lent, or otherwise -- isn't so much about guilt and sin as an opportunity for renewal. I gave up guilt decades ago during one Lent and have generally been good at recognizing and ducking it ever since. Guilt is backwards-focused. Renewal is backwards-informed and future-focused. Let me be the first person in the room to say that I actually don't find the word "renewal" satisfying. It's awfully tough to make something new once again. Have you ever bought a refurbished car or eBay item? Not exactly accurate if they were trying to make it "new" once more. A renewal subscription isn't entirely accurate either. I want them to "extend" my subscription, recognizing my commitment to the service or product - for good points and bad - worthy of sticking with it for more time. I want my faith, like my subscriptions, to be extended with commitment, not just renewed. Maybe I'm picky about the term, maybe I'm just a word connoisseur. In any case, renewal leaves me unsatisfied when talking about penitential seasons. So instead, to a techie like myself, it seems more fitting to think of Advent as a time to recalculate like a GPS or phone app giving directions. I know where I am, and it's not where I want to be; I know that I should be in a different place. Recalculate that GPS, and we find our journey making a little more sense. Recalculating rather than renewing guides me away from the problems and that I've found myself in and towards my desired destinations, the places I want to go. ...an opportunity to examine our relationships with others and with God–a time to ask, “Can we start over?” Advent doesn't require us to bathe ourselves in guilt. It doesn't require us to eliminate all the sin or bad things in our lives. That just isn't possible. Even Jesus did not eliminate all the evil in the world or heal all of the sick during his years of ministry. But while we are waiting for the birth of this Prince of Peace, we can accept the responsibility to be peacemakers–to be sources of reconciliation, even if in very small ways, in our lives. We also can accept responsibility for our relationship with God. A sense of awe and wonder and humility around the coming appearance of the Infant Jesus does not require us to fear the judgment of an angry God. In response to those who oppose the idea of Advent as a season of penitence, David Bartlett writes about Advent, “Perhaps the church can give up judgment, but we cannot give up responsibility." This works for me. For example, in my previous post "Disposable Me - an Advent Reflection" about the older gentleman on the jet, I cannot correct all suffering and I shouldn't feel guilty about everything that I see around me. But I can accept responsibility for my initial thoughts and reactions, for actions and inactions, for focusing on my wants and needs reflexively, without consideration of others. I'm blessed with a fiance who is astonishingly gifted in seeing the world from other people's eyes. A season of penitence isn't merely renewing myself, then, so much as recalculating where I want to be and where I want to go. I want the freedom to be the person I was meant to be. So our relationship with others and our relationship with God involves not making things new, at least to me. I want to learn from my mistakes and be guided by them. I don't want to repeat my errors. Instead, I want to recalculate and go from there. As Reverend Schenone said, "We can start over with God." May the meditations of my heart, with the inspiration of the saints who guide me, grow ever more aligned with God this Advent season. I pray that our gracious God moves me to the place where I want to be, to blossom from the person that I was and am into the life-sharing spirit that I am intended to be. I posted an article on Facebook yesterday about an incident on a jet. It's a little story, but it has affected my Advent meditations. It was my last flight of the year, which is meaningful since I travel 100,000-150,000 miles every year. This year was remarkably easy, as I only visited three continents, in contrast to six as I have in the past several years. Most of the travel is work, with some of it for growth and vacation. I mentioned that on this flight, a very old man who didn't speak English was delaying that last flight of my year. He wouldn't sit down and the flight attendants could not lock the door with his wandering. He was dressed ethnically, looked confused and was likely mentally distant and confused. I had seen him taken in a wheelchair to the jet. I was in the third row of this American Airlines flight, so I saw all the interactions with the crew. His caregiver, possibly a friend or grandson, was trying to explain what he needed to do, but he was resistant and confused. His behavior was angering people who were in a rush to make connecting flights. Quite a number were connecting in Los Angeles to continue to Hawaii for vacations. A few were band members who might have had a gig to attend. I saw soldiers who probably wanted to see their families. And I was tired, eager to enjoy the Advent season at home and my church, All Saints Pasadena. Sadness overcame me because his dementia was palpable and people didn't seem to notice. He was in the way of our immediate wants. I felt guilty because until I saw his age and his condition, I just wanted him to sit down and listen to the flight attendants. But when I did see, a light sparked in me and I realized that what I wanted wasn't him to sit down. What I wanted was travel mercies for all on the plane but, more especially, mercy on those like this man who lived a full life but needed just a little more time. After about 15 minutes of delay, he just was escorted off the plane by his companion. He was disposable. My heart broke for him and the family. He looked dapper with a nice suit and hat, but his eyes were vacant and sad. I knew the flight attendants had to be firm, but they were empathetic and uncomfortable. His companion was distressed. I felt bad they got off the flight instead of heading on to see family and friends. I prayed that it might be best thing to occur, given his present condition. We left after another 15 minutes delay, as the airline had to take his bags out of checked luggage as required for security. Which brings to to my reflection on the challenges of so many families, especially during the dark times of winter, in the bleak winter, when songs of cheer often cause melancholy because the world feels broken and unforgiving. I could not help but imagine that it was me with Mang (phonetically how my siblings and I called our paternal grandmother) struggling in her decline. That personal story is why my research at the University of Southern California was in Alzheimer's disease. It's also why I left the field because I get profoundly tearful by it from an existential level. Life is full of sadness, challenges, and changes of directions. People who were once mighty and powerful in spirit, mind, and body can be laid low by the punishment of time. I find the difficulties of dementia to be very provocative: who are we really? What is our soul doing when our mind isn't playing kindly? Where's the Holy Spirit when we begin walking down these paths? I wonder about this older gentleman, my new friend in spirit. Where is he now? Is he scared? Does he know he's loved? Advent as a season of waiting and repentance is not about waiting for death or choosing something that will fix things for us. It's not about wondering if Santa will make things right with the perfect gift, if I pray just right to Jesus. This little story on the jet from Chicago is making me think that, during Advent, we are waiting hopefully for those who around us, for those we touch and influence, and not for ourselves. It's making me reflect on a penitence of living better and not living for the fleeting moment, of loving better and not loving for the temporary smile. We light the candle of hope to bring justice and mercy to all, even if we don't know them personally. I didn't know this man, but I knew a lot about his life. I pray that my Christmas will be all the richer from what he taught me. We're hip and post-modern. The LGBTQ are getting married on the country's perimeters and progressive Midwest. But, the struggle for equality in our relationships, namely in the ability to marry the person we love, is not over. Yes, shockingly and in such a short time, we suddenly find that almost 40% of the country has marriage available in the LGBTQ community. That still means over 60% of our brothers and sisters cannot marry in their home states or churches. They could marry elsewhere and derive federal benefits, but most states will not respect such marriages. We're talking about disrespecting people. It's just not a caring, Christian stance to me. Beyond marriage, however, we certainly have more to do. A recent article "7 LGBT Issues That Matter More Than Marriage" points to some larger ideas that might be of interest to the community of faithful. Sadly, the issues identified aren't surprises. 40% of the young homeless are LGBTQ, a tremendously high proportion. Over 2000 incidences of violence against LGBTQ in the USA have been recorded since 2012. NYC has saw 7 attacks in May alone. A distressing 73% of LGBTQ homicides were people of color. The hurdles and harassment facing immigrants are that much more difficult in the LGBTQ community. Marriage may allow more LGBTQ access to health care, but if you're LGBTQ, you're still 10-20% more likely to be uninsured. Forget the images of rich, gay celebrities: you and your family are twice as likely to be living below the poverty line if you identify as LGBTQ. Extreme poverty and rampant suicidal tendencies are just the tip of this iceberg. It's time we go beyond post-modern. I pray that as we work towards meeting the needs of the 60% stranded by the marriage equality policies of their states, we begin the process of addressing these other serious issues. May the words of the prophets guide us into action on building a better, safer, fairer world.